MORENO VALLEY, CALIF. – Nov. 15, 2016 – Eco-Motive today revealed photos of the company’s patented (#8807098) dual-fuel “H-Motor” power plant. The full-scale prototype of the Eco-Motive H-Motor was completed in February 2016 and built to reflect the engine when it is installed in a vehicle. Eco-Motive’s patented dual-fuel H-Motor is a revolutionary, cost-effective technology that can cut global emissions, slash oil consumption and increase fuel flexibility for consumers. The principle behind the engine is brilliant in its simplicity and flexibility. The Eco-Motive H-motor can be powered by either gasoline or compressed natural gas (CNG), at a driver’s prerogative. Each bank of the engine is powered exclusively by one of the two fuels; with the push of a button, the engine can switch from the bank of cylinders fueled by gasoline to the other set using CNG, or vice versa. The H-motor is fed by dual gas tanks on either side of the drive shaft. A fuel inlet for each tank can be located on the side of the car where the tank will reside. Users can switch from natural gas to regular gasoline from inside the vehicle; the vehicle will stay in this mode until switched by the driver. The exact specifications may vary depending upon the OEM. The engine was invented by Herns Louis, veteran of more than 30 years in the parts manufacturing industry ranging from automotive to aerospace, specializing in computerized parts machining. This twin-bank engine is a result of Louis’s experience, along with his vision to help meet an emerging market need for more efficient, lower-exhaust CNG engines. A patent for the motor was granted in November 2014. Eco-Motive USA is developing an innovative new bi-fuel power plant that runs on gasoline and CNG. The Eco-Motive “H” engine was developed by Herns Louis, who has over 30 years of automotive experience. The H-motor will be manufactured in California and marketed directly to OEM automotive manufacturers worldwide. 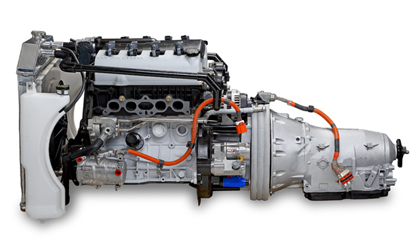 This engine can be a disruptive technology that gives manufacturers an edge in cutting emissions and fuel consumption.